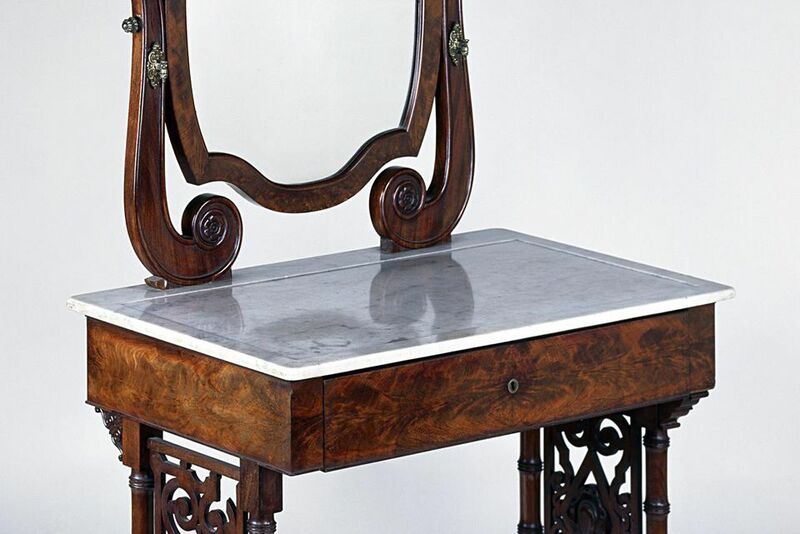 Louis Philippe style mahogany dressing table. The Louis Philippe style of furniture, which is still very much in vogue today, has its roots in a 19th-century French style known as the rococo revival. It takes its name from the French monarch who reigned from 1830 to 1848. Louis Philippe's reign saw a great rise in the popularity of this style, so much so that it became identified with him. Around this time coil, spring upholstery became popular, and the new curvilinear style incorporated it well. The Bedroom: Maybe the best-known signature piece from this style is the sleigh bed, and it can make any bedroom look special. The headboard is much higher than the footboard, and both have the curvilinear lines of a sleigh. Although traditionally made of dark wood, some contemporary beds are available in lighter wood and even metal. Sleigh beds are available in a range of price points and come in sizes from twin to king. Mirrored armoires are another hallmark of the Louis Philippe style, as are straight dressers with a curved top drawer. The Dining Room: The dining room should be warm and welcoming, and this style lends itself well to that. The color, beauty, and grain of the wood is a focal point of Louis Philippe furniture, and this creates a sense of richness, along with its signature fluid and graceful lines. Dining tables are often oval in shape and include leaves for adjustment. The two most commonly used supports are fluted legs or pedestal bases. The pedestal is often turned or fluted and is supported on a tripod. You will find a lot of cherry finishes in addition to the traditional woods used in this style. Storage Pieces: You will find many options in armoires, sideboards, and chests or commodes. It can be difficult to find actual antique pieces from this period, but a lot of manufacturers offer an updated look. You might occasionally find marble tops on these pieces, but metal drawer pulls that create interesting accents are easier to find. The Living Room: Louis Philippe-style sofas often have fluted legs and tight, curved backs. A Voltaire chair, often used as an accent, is an armchair with a low seat and high back. These chairs are framed in wood that is often carved. Although without excessive ornamentation, Louis Philippe coffee tables offer plenty of surface interest with the wood and veneers that are used. Sometimes metal accents add additional ornamentation. If you want to create a look of quiet, understated luxury, this might be just your style. And because manufacturers offer entire collections in Louis Philippe, it is easy to coordinate the look. Surprising History of the Term "Commode"